Part of what I love about being an expat is how easily and quickly we can all adapt to new situations. Sure, it might take a little effort for an American to learn to say that you’re taking the lift to your flat and to ask for the toilet, not the restroom. But after a while, it all comes naturally. That goes for daily life as well. It’s so easy to start creating new habits and to forget that something seemed strange when you first arrived. That’s why I like to write down my initial observations and whatever little differences I find when I arrive somewhere new. It’s also why I like to write down the reasons we leave a place – in case we start forgetting the parts that annoyed or frustrated us and instead look back with rose-colored glasses. Adjusting to expat life in Malta is very easy for Americans (for most people, really, but I can only speak to my personal experience). The language is English, the people are welcoming, and the country runs like most of our cities (no offense meant at all, Malta, but you’re very tiny and our cities are very large!). First things first, Americans: don’t expect clothes dryers in your apartments anywhere in Europe. Yes, you can get them, they do exist. But many apartments will not have them. We haven’t ever had one, actually! Not in Roatan, not in either apartment in Scotland, and not here in Malta. So get used to line-drying your clothes. I actually love this part of life in Malta, because the consistent sunshine and regular sea breeze mean I can dry clothes outdoors faster than it takes the washing machine to clean them! Plus, that outdoor, fresh smell is so much better than the shrunken mess you sometimes get from a dryer. Another note for Americans: most apartments will also not have dishwashers. Again, we didn’t have one in Roatan, we didn’t have one in Edinburgh, and we don’t have one here. Another note on household chores in Malta: this one was new to me here. Instead of a traditional mop or a Swiffer (like I used back in the States), they use a wet towel on a flat squeegee to clean the floors. Not a bad system, but you should’ve seen my look of confusion when I thought I had to pour a bucket of water and then squeegee it…somewhere! And, finally, very specifically to Malta: dust. This is an arid climate and we often get a sandy haze from North Africa. It’s also a hot climate so we tend to keep our windows open to capture the sea breeze whenever possible. Ergo, dust…everywhere. It’s just a fact of life here so it’s something you get used to and something you perpetually need to clean. As Malta is a traditionally very Catholic country, expect many places to be closed on Sundays. While tourism and its influx of foreigners is changing this for certain areas, don’t be surprised to find lots of bars and restaurants and shops even in Valletta – the capital city – closed on Sundays. Just be sure to check the opening hours before you trek somewhere on a Sunday. What you will notice, instead of families running to the grocery store and Target every Sunday, is a family having a BBQ by the sea together. Every Sunday. It’s a beautiful thing! Pharmacies in Malta will sell all your medicines. You won’t find any pills or similar necessities at the grocery store, the gas station, or anywhere else. You need to go to a pharmacy for anything over-the-counter and up through to prescriptions. Pharmacies in Malta also typically have a doctor available for walk-in appointments. Hours are usually posted on the door and any non-emergency issue could be checked on there. Another random Malta/British fact: I learned what an Ironmonger is! Now, this could just be me, but it was as if my friend was speaking a foreign language when she told me to check there for a replacement watch battery. “Go to the Ironmongery down on the main road,” she said…probably five times in her Yorkshire accent. She ended up walking me there and pointing to the sign, which did, in fact, say Ironmonger. It’s basically a hardware store with anything and everything you could need, from cleaning supplies to electrical equipment to tools and screws, etc. The many small convenience stores will all have fresh bread for sale daily – it’s usually around €0.80 for a loaf. There are also produce trucks that tend to park in popular parking lot areas within neighborhoods. They usually have quality local fruit and veg – and sometimes even local honey or oils. All this talk of chores and errands is just to say that life is life wherever you go. You need to do the laundry and wash dishes and run to the store for batteries and lightbulbs. When you move to a new country, you might need to ask for help from a neighbor or co-worker to find out the best stores and places to find certain items. There are also tons of Facebook groups for expats that are country- or even city-specific, so check there for advice, too. Moving to another country doesn’t change daily life, it just makes it slightly different as you learn foreign systems and routines. 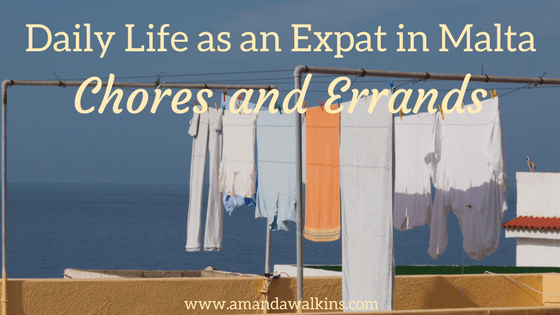 But that’s part of the fun and adventure of expat life! I’m obviously not one for doing the same thing over and over again, so I love these little differences in daily life around the world. They are small and truly insignificant in terms of who we are as people, but they create a varied global culture interlaced by commonality among neighbors. It’s a beautiful world we live in, I just hope that everyone takes whatever opportunities they have to explore and to better understand it!